The Atonometrics Continuous Solar Simulator and Light Soaking Chamber provides simulated sunlight exposure for steady-state testing of photovoltaic (PV) modules. The system can be used for various tests requiring medium or long-term exposure, including photo-induced degradation, power output stabilization, hot-spot testing, and accelerated performance evaluation. The system can be used to meet the requirements of IEC 61215 for crystalline silicon and IEC 61646 for thin-film PV modules. A unique design with two large test planes allows for the simultaneous exposure of 2 to 6 PV modules of typical sizes. The system can optionally include an integrated Atonometrics Multi-Channel I-V Measurement System, allowing in-situ characterization of PV modules during testing. The system can also include integrated sensors for light intensity and PV module temperature measurements. 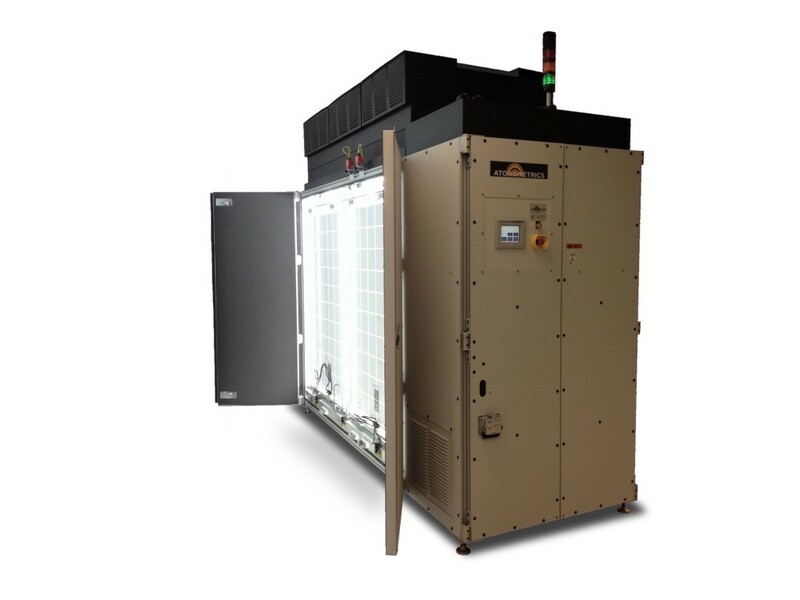 High throughput, small equipment footprint, and low cost of ownership make the system ideal for reliability testing in PV module manufacturing environments. Contact us today for more information on the Continuous Solar Simulator and Light Soaking Chamber or our other products.